Lately I have been struggling with over-commitment and more things to do than time. Between the business, hobbies, personal relationships, and other things that need to get done, sometimes there is just not enough time in the day. When all else fails, start making lists and prioritize. These are things that are both important and urgent; problems and fires that cannot be ignored. This is reactive work. Operating in this quadrant is stressful and draining. These are the tasks that are important but not in a rush for completion. This includes doing the things that would reduce the number of Quadrant I tasks; proactive work. Unfortunately, because they are not urgent they often get ignored in favour of Quadrant III tasks, which are urgent. These are tasks that are not very important, but urgent by virtue of time. These are the distractions that bring you away from what you need to be doing; the busy work that feels important. These are neither urgent nor important. They are often used to avoid Quadrant I tasks because those task are stressful and draining. Most e-mail, text messaging, Twitter and other social media falls into either III or IV. When all else fails, act busy. You can’t just work on what is important. You need balance across all the roles. The right mixture is up to you and your situation. You may also wish to cover all aspects of your life (business, personal, health and fitness, etc.). 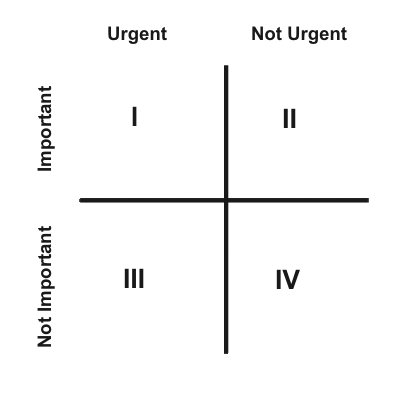 Once you have your categories AND your quadrants beside all of your tasks you can then properly prioritize them for action based on the relative time alloted to each category. This way you achieve balance. If you have many tasks in the same quadrant (I and II) you will need to further prioritize them. However, you do want to continue working on Quadrant II tasks, especially those that prevent things from slipping into Quadrant I. This is the proactive work you do and is extremely important for an entrepreneur. To do this you need to give up Quadrant III and IV tasks for a while. You can’t give up Quadrant I tasks, they are too important; so the only place you can get time is Quadrant III and IV. If you are spending the day being busy, but not really accomplishing your goals, this is a good starting point for understanding where you are going wrong and getting back on track. You may find you have really been procrastinating and you actually have more time than you thought. If not, at least you will know where to spend it.